In an overly competitive digital space, brands are now finding newer ways to reach out to their target audience. While social media marketing and ad placements are still sought by brands worldwide, the scenario is fast changing. With a boom in smartphone sales and higher internet penetration, brands got a freeway to reach new target audiences, at any time of the day! However, as expected, the increase in the pop-up and in-application ads started to turn people off. Soon, ad-blocks became popular, leaving the digital marketers high and dry. There was a definite need for a non-intrusive branding tool that could not only hold users’ attention but also prompt them to hit the ‘buy’ button. Marketers around the world are finding influencer marketing to be the best bet for this purpose. In essence, influencer marketing is planning the marketing strategy around key individuals that influence a large base of potential buyers. So, from food bloggers to gadget experts to stock analysts, individuals with a broad follower base, became extremely valuable assets for brands. 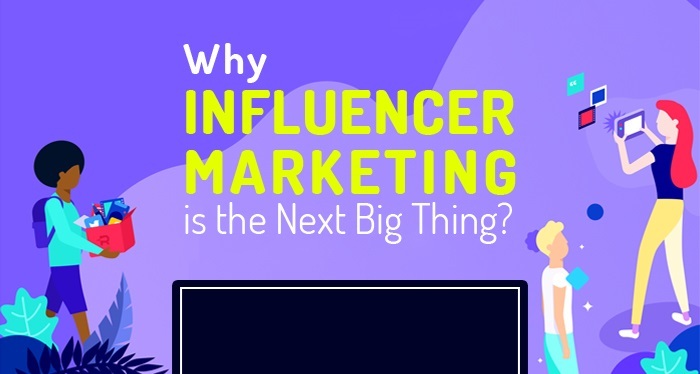 The comprehensively compiled infographic reveals interesting facts about the unprecedented popularity of influencer marketing as a sales and marketing tool among corporates globally. With the availability of vast content on any given product or topic, users are equipped with a lot of information to make an informed buying decision. However, as individuals, we all look for some genuine advice before making the smallest of purchase. Influencers, thanks to their specialized knowledge in a given area, fit the bill of genuine advisors perfectly. As people increasingly put their trust in the influencers, brands vie for long partnerships with the influencers, devising digital strategies that result in the quality lead generation and access to a pool of potential buyers.